If it does not matter how much money you spend for a first class airfare, one of the following deals may be the perfect choice for you. We found 2 great flight deals for you for this spring. One flight deal departs from Newark, while the other one from Chicago. 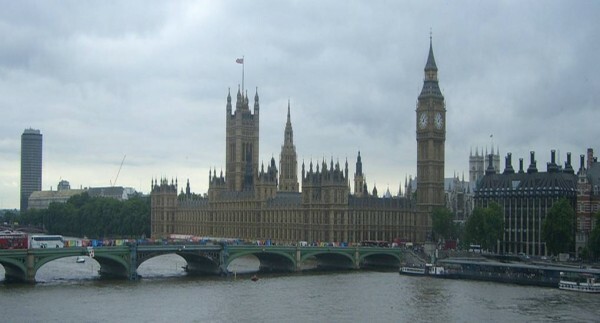 The destination is the beautiful English capital city in both cases. Now you can visit the most attractive sights of London and have a pleasant journey by choosing one of the following deals. Use the box below to search for these first class airfares and compare the prices with other providers’ offers. One of the two first class flights to London with SAS Airlines departs from Chicago. The price of a ticket on first class starts from $4,639 r/t. The flight departs on April 8, 2014 and returns on April 15, 2014. This way you will have the opportunity to spend an entire week in the beautiful city of London and visit all of its sights. You will fly from Chicago O`hare Airport (ORD) to London Heathrow Airport (LHR). The flight has one stop, at Stockholm, with a short layover of 3 hours 20 minutes. The total flight time is 14 hours 25 minutes. 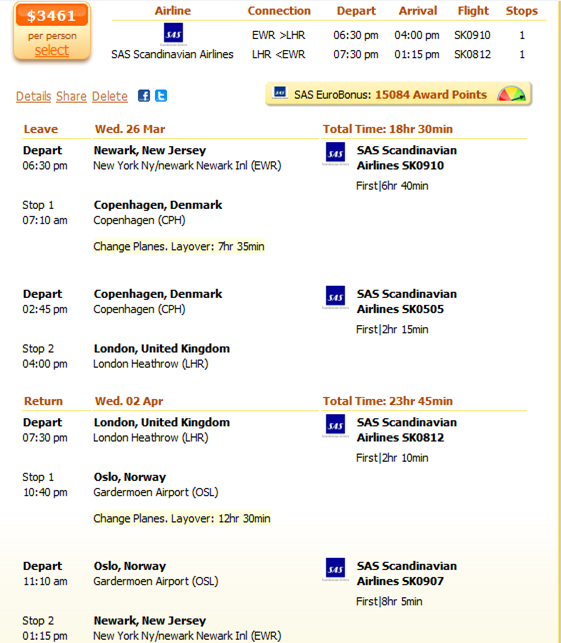 The return flight also has one stop, at Copenhagen, with a layover of 2 hours 55 minutes. The return flight time is 13 hours 50 minutes. 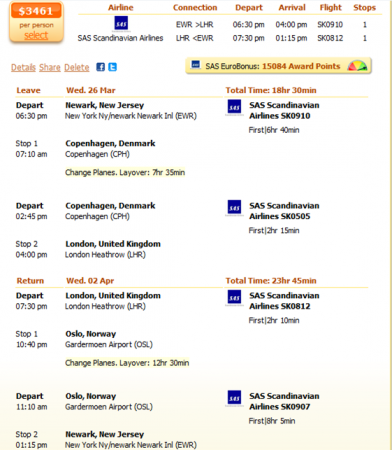 The other, also cheapest offer is a Newark to London flight, operated by SAS Airlines, too. This flight departs on March 26, 2014 and returns on April 2, 2014. You will fly from New York Ny/newark Newark International Airport (EWR) to London Heathrow Airport (LHR). Prices on first class start from $3,361 r/t.